Good morning lovelies! I hope that this weekend found you relaxation and joy. We had a full weekend, spent with family and friends. I'll have to share later all the fun we were up to, but for today I have something else in mind. Last week I posted a picture of my bedroom on instagram. I had to document the fact that my room was actually clean. Floors cleaned, rug finally laid, bed made, and everything dusted. Life is busy and sometimes these clean moments are few and far between. As I looked at the picture, I realized that in pictures you can hide the flaws of a room. The unfinished trim....the walls that still only hold primer....the list could go on and on. I live in a fixer upper. We bought this house 3+ years ago, paying cash for it. Yes it is a trailer and for some reason trolls on the web really hate that I call it a house....but guess what? It is is a house. It is a home, where my family resides, lives, plays, and lives life. I love it. I love the financial freedom it gives us at this time in our life. I am thankful that God lead us to this home because I have seen over and over again why we are right where we need to be at this time in our life. I see the people we have meet, the friends we have made, and the area we are in....it has all been to our betterment.....God has truly blessed us beyond our wildest dreams. With all that being said, I really wanted to give you a little sneak peak of my home. The finished and unfinished projects. The imperfections. This is by no means a picture perfect tour. This is a real life mama tour. Yes my house is clean and tidy, at the time I took these pictures.....it has since been enjoyed and lived in aka messes have been and are being made. I hope you enjoy this tour. I hope that it encourages you to look at your home a different way. Don't focuses on the things you want to change or the the things that are "wrong" with the space you are living in, but focus on the good. 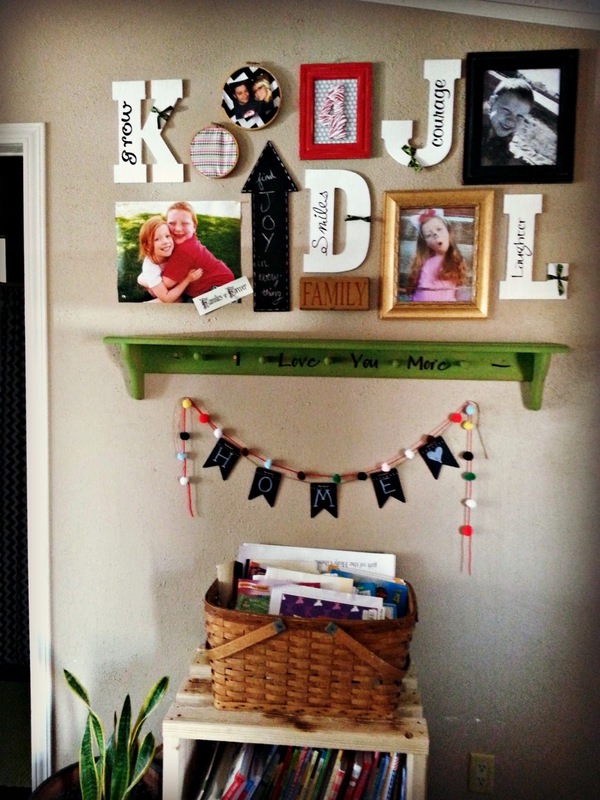 The pictures you can hang of your sweet friends and family. The little touches you can make to allow your space to be more welcoming. We do not have to live in huge houses to have an inviting home. We do not need things from the top brands to make it beautiful. We can spend less, create beautiful, and so much more! We live in a small home. I believe it is 1200 square feet. 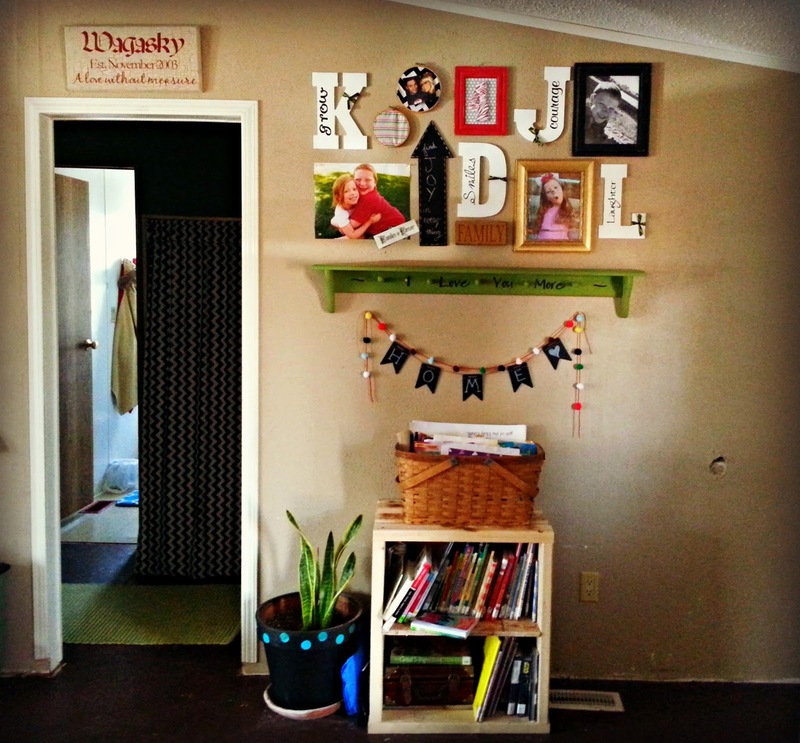 Yes this space is small, but we make the most of it with a few crafty, thrifted touches. I am a HUGE lover of vinyl. I love the fact that it easily comes off if you want to change things up and instantly gives a space a crafty touch. "Bless This Nest" is one of my favorite sayings. I also LOVE monograms. We have a lot of W's in our home. The wreath I made from a thrifted wreath form. I used an old sheet my Mom gave me to do the rag ties. The welcome mat is a handmedown from my Motherinlaw. Hubby snagged that during her last move. It is great for preventing the dusty footprints that are bound to happen living in the desert. Our floors are plywood and are painted. We use to have a hard wood plank flooring, but it was a bear to clean so Hubby pulled them out and is now using that wood to make planter boxes and our new kitchen table. The basket on top of the bookcase is from my mominlaw and is another hand me down. She thrifted it when my Hubby was young. It holds our school workbooks. Next I have a few simple garlands I made from yarn, pom poms, and chalkboard garland (purchased from Jo-Ann Fabric and Craft Store). The other little touches in our entry way are mostly from thrift stores. I am always looking out for cute, fun finds. Come back later this week for more glimpses into my home. Tomorrow I have a fun guest post from Amy @ The Little Farm Diary. Your house looks charming and warm! I think spaces we're most comfortable with come together over time and feel right. It looks great Danielle! Why must everyone criticize and minimize other people? It is shameful that they feel the need to judge. A above all, the place is YOURS (how many of us can say that? ), what you have done to it with so little is AMAZING! Don't let the trolls get you down! Your home is lovely. I can't imagine why anyone would want to to criticize you and your family and your home. You inspire me. You home looks like a place I would like to visit. Thanks for a peek into your space! 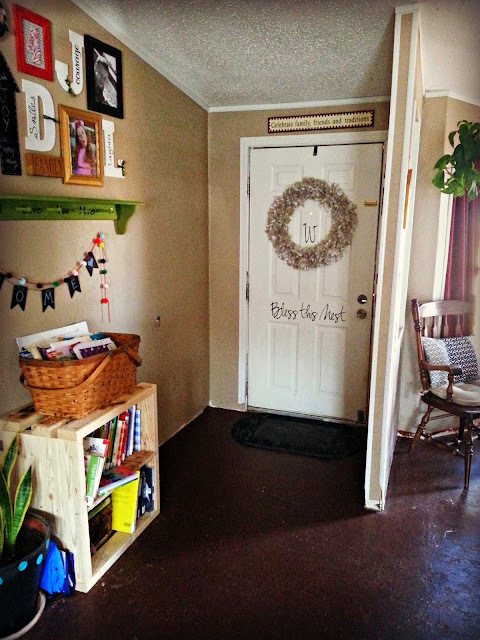 Your entry way is beautiful.. Love the monograms and the whole thing.. Just too cute. A home is a home where a family loves,lives, and enjoys each other.. [Not what type of stuff it is made from.. whether it be a trailer home or other.. who cares? Your Home is your home. It doesn't matter if it's a Trailer, an Apartment or a BOX! that Is where special memories are made! Plus paying cash for it and not having to worry about a payment is smart! I know what it is like to live in a fixer-upper. I love your entry way! It's very inviting I can't wait to see the rest! I think it's MORE impressive to dress up a humble home than it is to show off something lavish and new (and "paid" for with a big mortgage from the bank! LOL). I'm always inspired by seeing how creative you are and how comfortable and warm your spaces look. I luv it all! let me tell you we used to live in a 'trailer' and now live in a concrete foundation 'house' - I miss my 'trailer'!! we could afford to do fix ups and renos and all that stuff - hubby is very handy but when your worried about your foundation or plumbing or anything else in a concrete slab 'house' you have to call a professional in ($$$$$) and I want to spend my money elsewhere! I use the quotation marks because I too received those comments and crap, a HOME is what I want with my family - four walls and a roof, however that may come. I love my home now - but it's because it's the people I share it with not that it's on a slab instead of blocks. ugh! that so urks me! ur home is beautiful and LOVING - u can see it in all the pix you share. oh! the floors - are these the ones that yall put down a couple years ago?